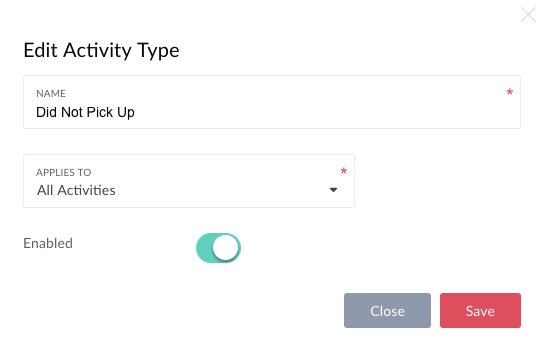 Your activity types are real tasks that form part of a business process. These link back to your Playbook and usually form a series of steps to close a sale, renew an account etc. Jiminny uses these types to categorize activity and provide a richer set of data for coaching and analysis. Note that these are different to (though in some cases resemble) opportunity stages. You can think of an activity as what actually moves a stage forward. By clicking the Category Order button, you can drag each type up and down to better represent the sequence. We'll preserve this order in dropdown lists. Now you've configured your activity types, it's time to decide how your team will score and coach them!